Camille DeAngelis is the author of Bones & All, Mary Modern, and Petty Magic. She is a certified vegan lifestyle coach and educator, and is currently veganizing an 18th-century Scottish cookbook. Camille lives in Boston, and you can find her on the web at www.cometparty.com. Caryn Hartglass: Hello everybody! I’m Caryn Hartglass. It’s time for It’s All About Food. Thank you for joining me today. I have to tell you, I just had an incredible lunch, and the flavors are still swimming around in my mouth. I love that, when you can continue to enjoy something even after you’ve finished it. So, do you want to know what it was? We had, last night, a new pesto sauce made with sunflower seeds instead of pine nuts. And it’s really yummy, and we had it last night. And I got leftovers for lunch, which is great. And you can get the recipe because I want to share it, it’s so good — at ResponsibleLivingAndEating.com. Just go there right now, and you can grab it. You can see some pictures. It’s right there on the home page. And there’s a bunch of other recipes we added this week; I’ll tell you about them, maybe, if you’re lucky, a little later. And you know this show: it’s called It’s All About Food, we talk about food, whether it’s healthy food or not-so-healthy food. Caryn Hartglass: [Laughs] You know what I’m leading up to, Camille. [Both laugh.] That’s my guest, who’s losing it before I introduce her. Well, anyway, here we go. So I have Camille DeAngelis on with me today, and she’s the author of a new book called Bones & All. She’s also the author of Mary Modern and Petty Magic. She’s a certified vegan lifestyle coach and educator, and is currently veganizing an eighteenth-century Scottish cookbook. She lives in Boston and you can find her on the web at cometparty.com. Okay, so, hi, and how are you doing, Camille? Camille DeAngelis: I’m great, Caryn, how are you? Camille DeAngelis: Thanks so much for having me. Camille DeAngelis: Yeah, yeah. And the point of the book is that flesh is not food. It’s not. It’s not food. A lot of people eat it; it is what we have been indoctrinated to believe is food, after thousands of years we’ve been eating it. That doesn’t make it right; that doesn’t make it ethical; that doesn’t make it fair to the animals and to the planet. Camille DeAngelis: Yeah. The thing that I keep, the thing that keeps coming into my head, is that bit in The China Study where T. Colin Campbell is talking about how flesh is actually the most easily assimilated protein, so he’s like, “If you want the most efficient protein, you should eat human flesh! Except, no, don’t do that. Why would you do that?” But that really…I mean, obviously, I was already a vegan when I read his book, but I was like, “Wow, you know, you can take it to a logical extreme that is completely insane.” But what is also insane is eating any other kind of animal protein, I think. Camille DeAngelis: And so, I actually have a funny story — I was like, “Oh, I can’t take this seriously,” right. But I was actually at Dirt Candy with a couple of friends, one of whom is also a longtime vegetarian. And when I told her this idea, over this delicious vegan meal, she just started giggling uncontrollably. And she was like, “I think you need to write this.” So I started writing it, thinking, “Oh, this is just this hilarious paradox.” Then as I started revising it — actually as I was revising it, I was working on the different reading assignments for Victoria Moran’s Main Street Vegan Academy, which is how I got my certification as a vegan lifestyle coach and educator. So I’m reading China Study as I’m revising the book, and I was also reading Victoria’s books, and I read John Robbins’ books, and I read The World Peace Diet by Will Tuttle. So all of these books, reading these wonderful, enlightening books made me realize: I can reach people with this book. This book is much bigger than me just telling a story to entertain you. So it became this book that I was hoping to have this message at the end, have people thinking as they look at my bio and they see that I’m a vegan, they’re like, “Oh, that’s funny.” Now they’re reading the book, hopefully they’re really into the book, and then at the end, in the Acknowledgments, I just lay it all out there. I’m like, “this book is about flesh-eating.” And so hopefully, it just gets you thinking about it. A lot of people aren’t like….When I had my vegan epiphany, it was just “boom.” I didn’t do Meatless Mondays; I didn’t do any of that stuff. It was just like, “this is the right way to live my life.” And so I just, there were no more animal products after that. And that was over four years ago, and this has been the happiest four years of my life, and the most fulfilling four years of my life, and the most prolific, also. So I’m actually really interested in talking to people about how going vegan can make you more creative. I’ve actually written about that on Victoria’s blog. Caryn Hartglass: That’s great. Because you’re clear; you’re clearer now. You’re not covered up with all kinds of crud and pus and flack. You’re clear; your brain’s clear. Caryn Hartglass: And it’s fueled. So I wanted to say, I think that more and more people are learning that meat, or at least a lot of meat, isn’t healthy, and that we really should consume a diet that is plant-centered. But we’ve known for a long time that eating other humans is really not good for us. But I think it’s funny that we’re learning that eating other animals isn’t good for us, either. It’s just gonna take time. But it’s very similar. Camille DeAngelis: Yeah. I think it’s going to be a really slow sort of unlearning and relearning process for a lot of people. But actually, I went to Vegan Drinks—I know you guys have that in New York, and we have a meet-up here in Boston once a month. And I met this guy who had a really interesting prediction, who went to last month’s meet-up. He said, “In about ten years, I think we’re going to reach critical mass. We’re going to have enough vegans, and enough people who are vocal—not in a militant way, but in a loving, ‘This is the truth,’ kind of way.” Which is what I’m aiming for: I don’t want to hitting people over the head with my truth, because that’s not actually going to do anybody any good. I went to a couple of barbecues yesterday, and of all of the people I was with, I was the only vegan there. And I was just quietly eating my veggie burger and my roasted portabella mushroom and salad, and roasted asparagus and potatoes, and it was delicious. And I was just quietly being who I am, and people can follow this example when they’re ready. Caryn Hartglass: And nobody was asking you about what you were eating? Camille DeAngelis: I was really surprised. I’d never met any of these people ever before, this was totally new, and so I was a little bit nervous about it. But everybody was just totally accepting of it; it was totally fine. I actually encountered more people hassling about it back when I was just a vegetarian. People took it as an affront. And it wasn’t even necessarily food that they had prepared, so it wasn’t like your Great Aunt Gertrude or whatever saying, “You don’t want to eat the food that I’m trying to nourish you with?” It wasn’t even that. It’s just like, I would be out somewhere, and people have this—they see it as an implicit judgment. I just want to sit and have my meal and we can have a conversation about anything you want to talk about. But it’s been actually totally fine. All you can do is just quietly eat whatever you want to eat, eating whatever you feel is right to eat, what is fair and ethical and honest and compassionate. You just want people to take the time that they need to get onboard with it. So I went off on a tangent here, but this guy that I was with was saying, in ten years he thinks that we’re going to reach critical mass; it’s going to become a totally mainstream lifestyle choice. And when it totally hits the mainstream—it’s already happening. It’s never been easier to be vegan. And I think how blasé all these meat-eaters were at these two barbecues that I went to yesterday really just goes to show how far we’ve come in the last ten years. It’s becoming more mainstream. But it will come to the point where everyone will see it as a mainstream lifestyle choice. Caryn Hartglass: Well, I hope that happens. I can’t wait. Ten years is not soon enough, and I hope it happens. Camille DeAngelis: I know, I know, I know. Camille DeAngelis: Yeah. I’m so glad that you felt that way, because I really wanted her to be identifiable. And a lot of it is the ordinary teen angst, just amplified times, I don’t know, twenty?Two hundred? Yeah, so, she’s a very isolated teen—in part, obviously, because of the thing that she does. And so her mother, every time she does the “bad thing,” as she calls it, her mother just whisks her away to another town and another state and they just start all over again. This is all in the first couple pages, so I’m not giving anything away to your listeners. But she also has to go out on her own, and that’s when she….And she still really doesn’t want to do the bad thing. But she’s on her own, completely alone in the world. And she’s just trying to make peace with who she is, or she’s trying to not be who she is. And then…Yeah, it’s kind of everything that we’re all trying to do. I was thinking the other day about personality integration, and this fits in with veganism perfectly. You want to think about yourself as a caring, compassionate person, but you have to look at every single aspect of your life, and are you behaving compassionately in all of those sectors? Not just how you treat other humans. Caryn Hartglass: Okay, I have a question about another character in the book. His name is Sully, and I’m not going to say anything more about him except that he’s an older man. But I was wondering what was behind your choice, what was behind him, in that he was also an Eater and he didn’t decide to consume Maren right away. He was kind of following her around. What was behind that. Camille DeAngelis: Well, I’m trying to think of a way to talk about him that isn’t spoiler-y. Caryn Hartglass: Oh, okay, well then you can tell me off-line sometime. [Laughs] I was just kind of curious about that. Camille DeAngelis: Yeah. But he’s definitely playing a cat-and-mouse game with her. She doesn’t realize it at first. Caryn Hartglass: A cat-and-mouse game, okay. Camille DeAngelis: Blood banks? Oh, animals. I haven’t seen it, and I haven’t read the books. Camille DeAngelis: [Laughs] I heard they weren’t any good, so that’s why I haven’t read any of the books or seen the movies. Caryn Hartglass: But I’m wondering, maybe there is going to be a series, and maybe later on, Maren will try to abstain from flesh-eating? Camille DeAngelis: I have not done a series so far, and when I wrap up the world that I’ve created, and I give the characters their fates, I’m on to the next thing. And I hope that I’ve made my point with this book. And the next thing I do, actually, speaking of the eighteenth-century Scottish cookbook, my little side project, I have a companion project to the main one, which is set in eighteenth-century Edinburgh. And part of the story follows the family of Pythagoreans who have a sort of animal rescue thing going on in their house—they’ll take in injured foxes and things—and they don’t eat animals. Which is actually less of a freakish thing than you would’ve thought, back then. There were a lot of people who were preachers, a lot of preachers who were speaking out against flesh-eating back then. And I guess it was less feasible to abstain from all animal products. But there was definitely a consciousness of it that you might not have expected—I mean, the word “vegetarian” wasn’t coined, as you know, until the mid-19th century, but there were vegetarians back before that word existed. Caryn Hartglass: There were “Pythagoreans” a long time ago. Camille DeAngelis: Yes. And I want to write about them. The story is going to be so fun; I can’t wait to write it. But I’m still going to be exploring vegetarianism and veganism in my future fiction, for sure. In a more overt way, which is going to be really fun. Caryn Hartglass: And do you have some Scottish background in you? Camille DeAngelis: I don’t, actually. I have some Irish ancestry, but no Scottish. I did actually go, I was really fortunate, to be granted a residency at this place called Hawthornden Castle, outside of Edinburgh. It’s a writer’s retreat, a writer’s colony. So I went there a couple years ago for a month-long residency, and actually revised Bones & All while I was there. But I was collecting a lot of fun historical tidbits from the different books that I had found in there, at the National Library of Scotland. I loved walking around the old city, the old town, and soaking up the atmosphere. Because you can still feel it. There are a lot of places where the city has become so modern that you can’t picture what it was like two or three hundred years ago. But you can picture it very easily in Edinburgh. Caryn Hartglass: You can picture it in a lot of European towns. That’s what I love about Europe. They build these incredible buildings that have been there for hundreds and hundreds of years. It’s incredible. I love it. And I did love Edinburgh. There was a vegetarian restaurant, or a vegan restaurant I went to in Edinburgh about ten years ago, and I got vegan—what’s the famous Scottish dish? Camille DeAngelis: Yeah. I’ve had vegan Haggis. It’s really good. I think it’s made with lentils and walnuts? Caryn Hartglass: I don’t remember; it was a long time ago. But it was good. Camille DeAngelis: Really good, yeah. Caryn Hartglass: And I don’t know what the original version tastes like because I’ve been vegetarian a very long time. I have another Maren question, the character in your book. Is she based on anyone? Is there any of you in any of the characters? Camille DeAngelis: You know, there’s a little piece of me in every character, I think. And that might be sort of a diplomatic answer. But you have to create this person from somewhere. And you have to give them motivations that feel compelling. I mean, yeah, I guess I would say if she’s based on anybody, she’s based on me. Only in the sense that I was a little bit of a loner in high school. I definitely remember feeling isolated, and lonely, and I felt like…I didn’t feel understood. So that was what I drew on when I was fleshing out her character, as it were. So I guess I would say that she’s based on me, but only in that sense. Caryn Hartglass: Right. So, you’re in Boston. And I know there are some great places for vegan food. Do you have some favorites? Camille DeAngelis: I do, I do. There’s actually a really great place like a ten-minute walk from me. I live in Somerville, and so there’s a place in Teele Square called True Bistro which does the most delicious brunch. It’s really, really good. We have a couple of really good vegetarian places. I wish they were vegan, but I understand why one of them isn’t. It’s called Veggie Galaxy; it’s at Central Square in Cambridge. They sort of specialize in getting meat-eaters in the door because it’s very 1950s-diner-y kind of thing. And then you look at their menu; it’s full of comfort food. And it’s like heaven for vegans too, because everything, it’s everything vegan. They have omelettes and stuff like that, which as I said I’m not thrilled about. But they have a lot of people who would ordinarily never, ever, ever go to a vegetarian restaurant will go there, and then it starts to feel accessible. And so then they’re more open to it. So I understand why they do that. So I really like that place. And Live Alive in Central Square in Cambridge as well. And there’s the Walnut Grille in Highlands; that’s really good. Yeah. There’s a place called My Thai downtown, in Chinatown. There’s Cocobeet, which is more of a takeout place. Yeah. I want there to be even more places, you know? That’s why I love coming down to New York, because it’s just like, “Yeah!” Last time I was there, after Victoria’s book launch last week, I went to Blossom. Caryn Hartglass: Oh, that’s where we went. I missed you. Camille DeAngelis: Oh my gosh! I don’t know how I missed you. That’s so funny. Well, we stayed at the bookstore a long time. Just chatting with all my friends I don’t get to see very often. So, yeah, we’ve got some really good places here; I just wish there were more of them. Caryn Hartglass: You mentioned omelettes at that one restaurant, and that just triggered a little something. So I just posted a bunch of recipes on my website, ResponsibleLivingAndEating.com, and one of the recipes is this French herbed no-egg omelette. And I don’t know if you’ve ever played with Socca, or garbanzo bean flour, but they make incredible omelettes. And I’m just nuts for them lately. I go through these phases, and I’m in my no-egg omelette phase. And I just had one that was just so good. So one day, in ten years or so, like you said, we’ll be there. Camille DeAngelis: Yeah, I sure hope that guy is right. Caryn Hartglass: Now, can you tell me what “comet party” means? Your website is cometparty.com. Camille DeAngelis: …non-human people. It’s funny, because when I say “people” now, I’m also thinking “non-human people.” Because I love the concept of a non-human person. And I was explaining this to somebody who still eats animals, recently. And she was actually more open to it than I thought she would be. So I’m feeling really hopeful about that. Caryn Hartglass: Well, come on, if legally a corporation can be considered a person, why can’t a non-human animal? I mean, really. Caryn Hartglass: Okay, I want to mention one last thing before we go. Are you familiar with the musical Sweeney Todd? Camille DeAngelis: Yes, but I haven’t seen it. Caryn Hartglass: Okay, well, I’ve performed in it a number of times. I think it’s my favorite piece. I’ve played Johanna, the sixteen-year-old unfortunate ward of this evil judge. And when her father comes back to London to get vengeance and find his wife, who’s gone nuts—it’s a complicated story—he hooks up, in his old barber shop, with this woman underneath who has a pie shop. And he wants to get the judge in his shop so he can cut his throat and kill him. So he’s practicing, and he’s practicing on other people, lonely people. And then they have to decide what to do with the bodies, so they end up—since it’s London in the Industrial Age and people are poor, and meat is hard to find, they end up cutting the bodies and putting them into meat pies. And the pie-maker’s business is flourishing; nobody knows, of course. [Laughs] But when the pie-maker first suggests to the barber that this is what they can do, they sing a duet. And it’s called “Have a Little Priest.” And she talks about the different kinds of people, and how they might taste. It’s quite comic; it’s really fun. And I just want to play that at the end of this segment. So I just wanted you to know what it’s going to be about. And it’s just—the segment we’re going to play is just the last bit of the song. You’re not going to hear most of it. But it’s a recording that I have—me, and my partner Gary, and we’re called the Swinging Gourmets, and I wanted to end with that. So, Camille, I want to thank you for joining me on It’s All About Food. 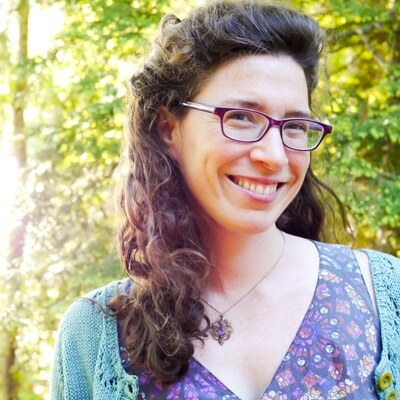 Caryn Hartglass: And thank you for this enjoyable read, Bones & All. I look forward to seeing more of you at more big veg events here and there. Camille DeAngelis: Yeah. Thank you so much, Caryn. I had a great time. Yes, yes, I know, my love. We’ll take the customers that we can get. High-born and low, my love. We’ll not discriminate great from small; no, we’ll serve anyone; meaning anyone; and to anyone at all.